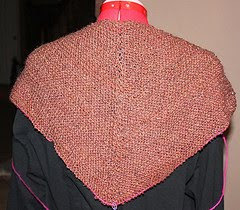 Making steady progress on the Clapochet shawl and should have it done by my goal date of February 1. 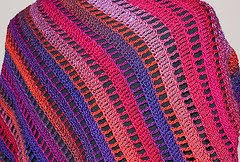 I'm most of the way through skein #2 and the shawl is just over 36" long; I think the 3 skeins I have will be enough to finish it. Really didn't want to buy another one since one of my goals this year is to use up stash. The handspun knit shawl is also progressing and it's going much faster, now that I've switched from 'throwing' to 'picking' (Continental knitting), despite the "help" I get from Lily. 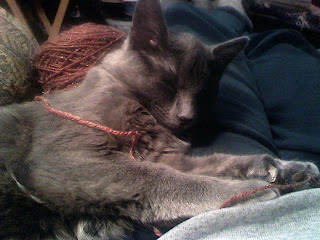 She's discovered yarn in a big way and believes that every little piece needs her seal of approval. Good thing she's so cute. . . . I took the shawl off the needles and put it on waste yarn (the pink stuff in the photo below) to check out the size and appearance. The arms are supposed to be long enough to wrap around and tie behind your body; definitely have a ways to go yet. It's not perfect but it's my first knit shawl and I love it.